Traveling in Greece can be an unforgettably pleasurable experience provided the traveler is well informed by professional travel guides and is aware of some very helpful tips that will prevent unwanted surprises. The vast majority of tourists visit the islands of the lower Aegean Sea, the Cyclades, the Dodecanese and Crete and some of the Ionian Sea islands, such as Corfu (Kerkyra) and Zakynthos. 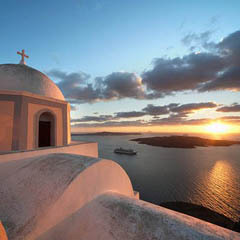 However, other Greek destinations have become popular since the 90’s. In the Aegean, these are the Sporades islands, the North-Eastern Aegean islands, Thassos and the Saronic Gulf islands. In the Ionian Sea, the entire Eptanissa group (meaning seven islands group), also referred to as Ionian Islands, have become major tourist resorts, while the popularity of some of the smaller islands is rising significantly. Inland Greece is also becoming popular, with many tourists visiting Chalkidiki, the Peloponnese and Epirus. There are several tours, with Athens as a starting point in most cases that can help you travel around many parts of Greece in short bus tours of 1 to 7 days. These tours have a variety of characters, such as tourist, religious, historical, sightseeing, island hopping, folk handicraft etc. Some of these tours are guided or you may choose to hire your own private guide. A new ‘profession’ has risen in Athens recently. Multilingual taxi drivers can be hired, individually or in small groups, to act as travel guides and accompany a small group of tourists in any part of mainland Greece, for one or more days. Although local transportation is quite regular, traveling in mainland Greece is easier by car. Public transportation is also widely used.